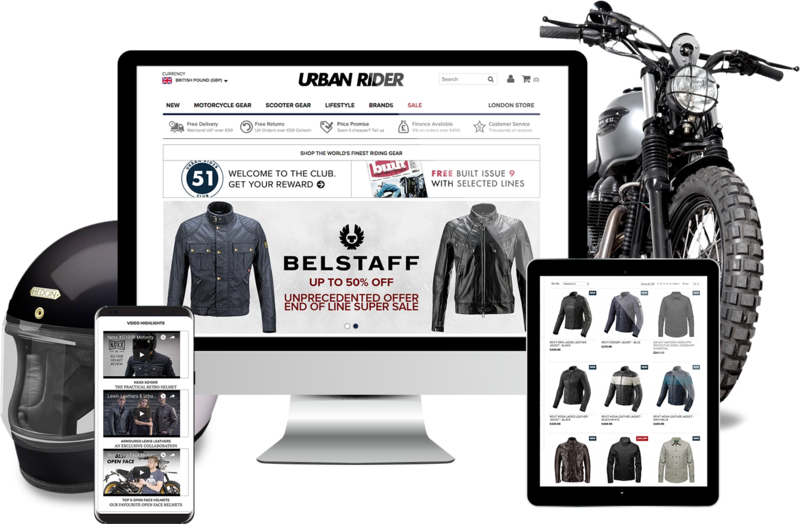 Urban Rider is one of London’s leading suppliers of motorcycle and scooter clothing store, having been featured on the BBC, Channel 4, Channel 5, Sky TV, and in the Daily Telegraph. They are the largest supplier of Tucano Urbano scooter clothing and have the largest range of Belstaff Pure Motorcycle collection in the UK. Urban Rider has a friendly and enthusiastic staff who offer in-depth knowledge on all their products when helping customers select from the wide range of products. We refactored many of the UI elements on the Urban Rider website. We extended the layered navigation with filters to sort through different types of products and added visual colour selectors to represent configurable products on the category page. We designed and built a brand new product type that allows customers to select and bundle different assortment of products into one product. Setup an intelligent currency switcher based on customers’ locations and automatically apply the correct tax rules. Furthermore, we identified broken functionality and resolved all known bugs. Created the brand new Wild Tracks WordPress website for dedicated blogging on biking trips. This WordPress was introduced alongside Magento and included an easy to use image gallery with social media integration. Further to help boost Urban Rider’s SEO efforts, we implemented Google’s Rich Snippet which presented product data as reviews/pricing/category/stock status, all within Google search result page. Urban Rider was extremely pleased with the positive results from all development work we carried out. They were impressed with the quick turnaround to meet each milestone and our technical expertise. The UI improvements have had a positive reaction from their online customers. With the automated currency switcher, it allowed them to appeal to a wider demographic audience. The increased product data visualisation on Google has, in turn, helped increase their click-through rate. Due to the overwhelmingly positive outcome, we have continued a long working relationship with Urban Rider.